If nothing but the best will do, then you will want to find a luxury 5 star quality graded country cottage or holiday house. 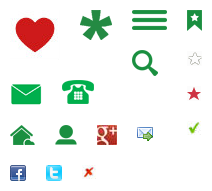 These are all rated as 5 star by the Tourist Boards or by an agency that performs their own inspections and assessments. For the best of the best, look out for award winning properties. Country Cottages Online features a range of beautiful cottages from luxury cottages for 2 to large luxurious houses. Additional top quality luxury accommodation not registered with tourist boards can be found using the Cottage Search. You can find more ideas for luxury cottages at Cottage Gems. For the full listings of 5 star luxury cottages use the links above. Luxurious and 5 star rated holiday cottages are ideal for those looking for the highest levels of comfort, style and quality. Holidaymakers that book 5 star rated holiday properties do so for the levels of reassurance that comes with such accommodation. When you book a 5 star rated property you can be assured that the holiday cottage has been assessed and graded by a tourist board or agency against a set of quality criteria. For those seeking even higher levels of quality assurance, look out for gold award winning properties which have been specially recognised for their exceptional levels of customer service. Quality graded cottages are popular so booking early is recommended. Book direct with owners to save on booking fees and to obtain best prices or if you prefer book with one of our trusted agencies. There is something magical about a luxurious cottage break in Northumberland. Staying in beautiful high quality holiday accommodation is most enjoyable, add to that the majestic outdoors and stunning natural beaches of Northumberland to create a heavenly experience. Northumberland is also dark sky country – a place where you can sit in the garden of your holiday home and admire the glittering number of stars in the Milky Way. Treat yourself with an indulgent luxurious cottage holiday in Northumberland. 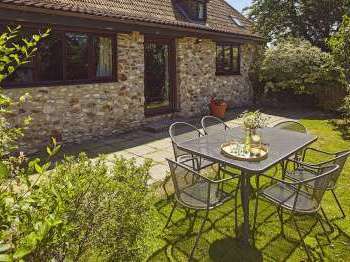 Sleeping up to 18 people, for short breaks and longer stays, Trevase Granary provides a great 5 star location close to the Wye Valley for a group of friends or family to stay together, relax and enjoy themselves. 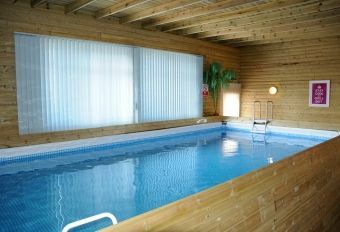 The fantastic leisure facilities at this country holiday home include a hot tub and a games room. The beautiful Herefordshire countryside is wonderful for walking, cycling and even horse-riding if it takes your fancy. These award winning cottages offer a wonderful array of indulgent leisure facilities and extra niceties to make your self-catering holiday effortless and comfortable. Your comfort and relaxation are of the utmost importance at Trevase Granary. Click on the photograph to find out more about a luxury self-catering experience in the Wye Valley. This cottage set in beautiful grounds of an Edwardian country house, has a luxury 5 * ETB status and sleeps 6 -7 people very comfortably. There is also a tennis court and croquet for guests to enjoy as well as the glorious setting in quiet Derbyshire countryside. 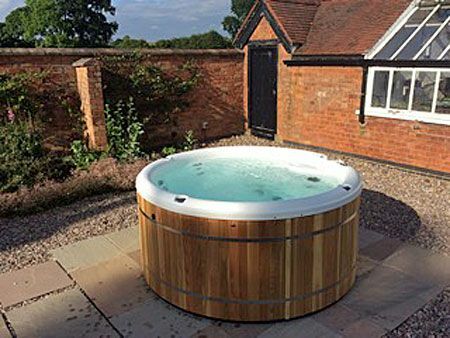 Recently added, this high quality holiday home now benefits from access to a private hot tub where you can spoil yourself with long relaxing soaks in the warm bubbly waters. Well equipped, guests want for nothing, with host on hand to advise or help. Limited disabled facilities, and well behaved pets welcomed. Oxfordshire offers much for cottage breaks, not only is the countryside magnificent but ther eis also Oxford and the univarsity to visit, charming Oxfordshire village and the Cotswolds are on the doorstep. Find luxury 5 star cottages within easy reach of the Cotswolds in Oxfordshire. Also not too far away is Oxford, the Ancient Ridgeway and the Thames footpath. There is a golf course next door and the championship courses at Frilford Heath. A wide range of great local pubs and restaurants are also close by. For the angling enthusiast, there is a varied choice of coarse and fly fishing on the Cotswolds lakes, the Thames and the Cherwell. Various extras are available at certain luxurious Oxfordshire holiday cottages, perhaps bicycles are available for guests to use, canoes for a paddle on the River Thames or gourmet meals delivered to your door. Click the link for more luxury self catering in the Cotswolds. 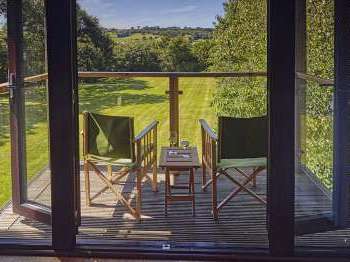 At Treworgey there are a range of one, two, three and four bedroom luxurious 5 star Cornish country cottages. Set in the Looe Valley, the luxury self catering holiday accommodation comes with use of an outdoor heated swimming pool. As the cottages are located on a farm, there are also opportunities to meet and greet farm animals here too. With a wonderful setting with views over the Looe river valley, Treworgey is a special place to enjoy a holiday. 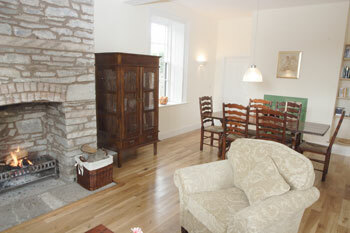 The cottages at Treworgey have been lovingly decorated with interior-designed interiors. The cottages successfully blend character features with that luxury touch. 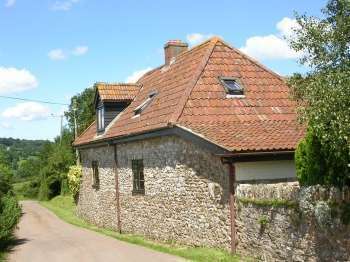 There are a range of cottages from romantic cottages, some of which have four poster bedrooms to family cottages. Many of the cottages have delightful private gardens. Marvel at the country and in some cases, sea views. At Treworgey there are a total of 150 acres of garden to enjoy and explore. Click on the photo to find out about availability and bookings and for more information on these beautiful cottages in Cornwall. There are a total of fifteen luxury self-catering cottages at Beacon Hill Farm near Morpeth and Alnwick in Northumberland. Beacon Hill Farm is an award winning development that has won a number of accolades. As well as offering luxury, high quality accommodation, there are excellent leisure facilities here with a swimming pool, Jacuzzi, beauty salon and gym on site where you can enjoy a touch of pampering by arrangement (additional fees apply for spa and beauty treatments). With such wonderful facilities, Beacon Hill has to be an excellent choice when it comes to finding somewhere to relax. Enjoy taking it easy in this part of Northumberland or if you like to keep active why not get out and about and enjoy the local countryside? Beacon Hill Farm comprises a total of 350 acres of woodlands and pastures. There are fabulous views towards the coast and hills. If you enjoy fishing why not have a go on the 2 acre lake where you can fish for trout? In terms of accessibility, three of the cottages are M2 grading for access. If you have special access requirements do get in touch with Beacon Hill and ask them to advise you. All the cottages are centrally heated and most have open fires. Kitchens have every machine and gadget you could hope for. Click on one of the above photographs for more details on these luxury Northumberland cottages. 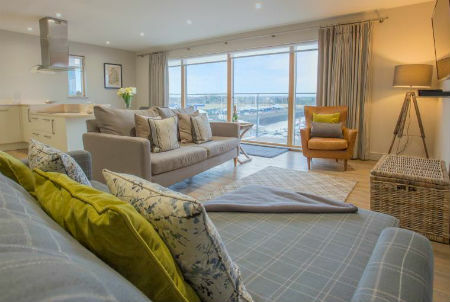 Ideal for guests looking to stay in style and luxury in coastal Northumbria, this stylish 2 bedroom apartment sleeps up to 4 people and boasts stunning views over Amble marina. 5 star rated and awarded by Visit England, this high quality property with its stylish interior and coastal views is bound to impress. Breakwater is a superb base from which to discover the stunning Northumberland Coast Area of Outstanding Natural Beauty. There are also plenty of relaxing activities to enjoy nearby such as walking, cycling and wildlife watching. Let’s also not forget the interesting places to visit nearby such as Alnwick Castle and Warkworth Castle. 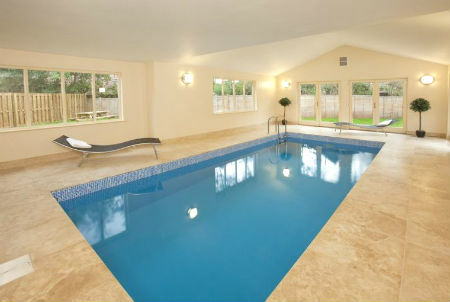 Enjoy exclusive use of the indoor Heated Swimming Pool at Foxcombe, near Taunton in Somerset. It is a perfect luxury lodge for holidays and short breaks accommodating up to 14 people in this luxury spacious 5 star accommodation. Six bedrooms and six bathrooms mean no queues for the bathroom here! State-of-the-art kitchen well equipped for entertaining. Additional leisure facilities include a games room for fun times. 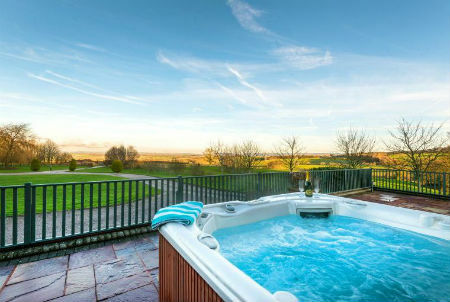 Click on a photograph of this luxury Somerset cottage with its own swimming pool for details. For a luxurious country retreat, take a look at Little Canwood House in Herefordshire which sleeps up to 8 in 4 bedrooms. This rural retreat is set amongst beautiful countryside yet is just 15 minutes drive from Hereford. Offering 5 star luxury self-catering accommodation, with its wood burning stove in the lounge and exposed wooden beams in some rooms, this cottage should be a simply charming place to stay. With farmlands all around there are plentiful opportunities for country walks and there are also woodlands nearby. Whether you are travelling with friends or family, this cottage should be a very relaxing place to stay. Click on the photograph to view details. Beautiful country house, set on the outskirts of the Forest of Dean. The accommodation at Viney Hill Country House in Gloucestershire is simply stunning and the location is to match. With a swimming pool for your exclusive use during your stay, as well as a games room to keep you entertained, this is a fantastic holiday property for groups or large family getaways. 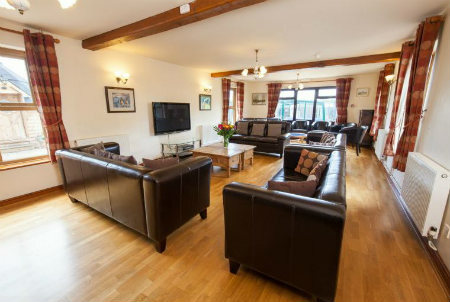 This high quality property sleeps up to 16 people with 8 bedrooms and 8 bathrooms and offers superb high quality accommodation for a week’s stay or short break. In terms of places to visit, the Forest of Dean is easily accessible and the Wye Valley too is just an easy drive away. For a memorable self-catering holiday in Scotland could there be anything better than a stay in a high quality log cabin with private hot tub set by the countryside of the Scottish Borders? For a truly indulgent stay, each of the luxurious log cabins in SCotlan and the Borders has its own warm bubbly private outdoor hot tub and sauna, perfect for a relaxed and pampered holiday. These luxuriously fitted out self-catering log cabins are set in a peaceful location, just one hour’s drive from Edinburgh and within reach of the Northumberland and Berwickshire coast for days out. These very special lodges are 5 star rated by the Scottish tourist board and also have a certificate of excellent from TripAdvisor. Click on the image of the luxury accommodation to find out more about a holiday with that bit extra. Stable Cottage in Wrexham, Wales is a luxury cottage with the wow factor. Not only is this 5 star property beautifully furnished but a stay here comes with exclusive use of the owner’s heated indoor swimming pool. What’s more there is also a hot tub for the ultimate in relaxation. Other special touches here as you may expect with a 5 star cottage include full Sky TV, Wi-Fi internet access, hairdryers in each bedroom and LCD TV in both of the double bedrooms. This cottage sleeps up to 10 people in 4 bedrooms and is located on a small farm in Wrexham. If you can bring yourself to leave the comfort of Stable Cottage there are plenty of things to do and places to visit in the local area. There are ample opportunities for walking, cycling, fishing and golfing nearby. If you like historical houses why not visit Erddig Hall, a fine country house or Chirk Castle with its 700 years of history? The world heritage site of Pontcysyllte Aqueduct is also nearby. For more details of the layout of the accommodation and for more information on this luxury cottage with a pool in Wales click the photograph. 5 star rated by Cymru Wales, Caban Iwrch is a luxurious 5 star rated high quality wooden log cabin with a warm bubbly hot tub which has the added bonus of excellent hill walking close by. This 5 star assessed pet-friendly lodge is ideal for short breaks or longer stays. to find out more about staying in a luxury Welsh lodge or click on a photograph for details. The views in this part of Wales are absolutely stunning and need to be seen to be believed. This select development features three luxurious cottages in the Wye Valley in Wales. 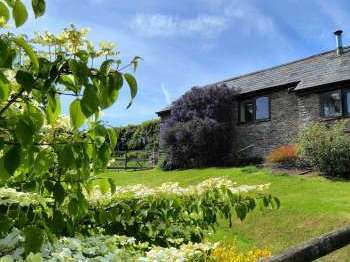 These cottages are 5 star rated properties set around a cobbled courtyard on what was originally a farm, near the Black Mountains and Brecon Beacons. With original features such as exposed beams in some cottages and high quality décor, a stay at Glanhenwye should be both comfortable and enjoyable. One of the cottages, Jessica, is pet-friendly whereas the others are pet-free and dogs are not permitted. There are plentiful facilities if you wish to cook but equally if you prefer to eat out from time to time, there are a number of excellent pubs and restaurants just an easy drive away. The cottages are set in 5 acres of countryside and each offers space and privacy. There are a number of walks and plentiful opportunities to enjoy outdoor activities nearby. There is some stunning countryside to discover in this part of Wales with rivers, mountains and farmlands. Enjoy getting out and about and exploring the Black Mountains, the Brecon Beacons and the Wye Valley. Please click on the photograph for details of these modern spacious luxury 5 star cottages in mid Wales. How about spoiling yourself with a stay in a luxury pine lodge in Wales? 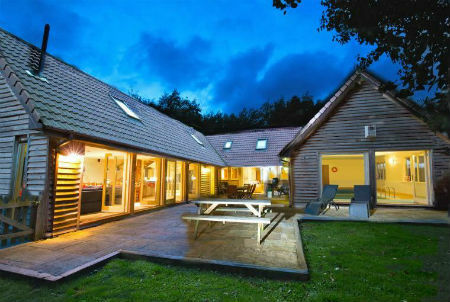 There are two luxury 5 star wooden lodges set in the countryside on a sixty-acre estate in this lovely part of Wales. These lodges are ideal for romantic and relaxing self-catering breaks. Each luxury lodge has 3 bedrooms. Each has its own hot tub on the veranda and also a king sized four-poster bed with ensuite bathroom. Bathrooms also benefit from a sauna, Jacuzzi and power-shower so you can get your day off to the right start. Enjoy feeling pampered. If you adore relaxing treatments then contact the owners of the luxury lodges for details of the beauty treatments that can be arranged locally by request, charges apply. For those who care about the environment, take note, these luxurious lodges are green tourism gold award winners. 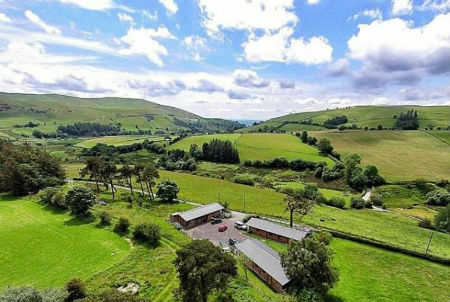 These lodges are set amongst glorious Welsh countryside and are also well situated for exploring mid-Wales. Nearby are the Cambrian Mountains. You can also visit Snowdonia National Park, the edge of the park, is around 15 miles away. The Welsh Coast is also just half an hour away by car. On site there are also two wild-life ponds and fishing is possible. Guests are greeted with a complimentary welcome pack so you can start your break off well. 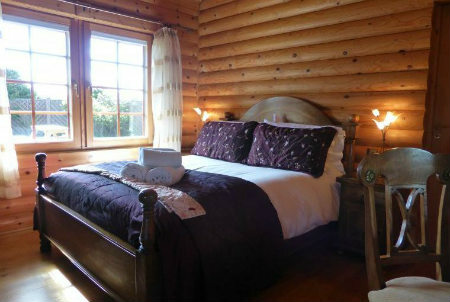 Please click on the photograph of the luxury pine lodges for details. Five star graded cottages are at the top end of the luxury scale. Each will be attractive, spacious and supremely comfortable. We hope you find the perfect high quality holiday cottage to rent from the selection of luxury properties featured on Country Cottages Online.